Completely off the standard beaten track, the lodge is a special and non-touristic place to stay and is about location and experience rather than just another accommodation option. Come for living and walking with nature in Weliara jungles, an isolated wilderness in the remote southeast Sri Lanka. The Weliara jungle is hidden between Yala National Park and the Rahat Kanda mountains � a 20 km ridge of steep ridge of rocky hills, separating civilization from wilderness. carved out of a large rock wall. These figures are quite unique being of the Mahayana Buddhism, as the Theravada school of Buddhism historically has been all-dominant in Sri Lanka. One of the beautiful figures is thought to be the mythological Bodhisattva, Avalokitesvara. The huge crystalline limestone rock statue of Maligawila dates back to the 6th century A.D. For centuries it laid fallen and covered by thick jungle until rediscovered in the 1950s. It was restored during 1989-91. We are in the south eastern part of Sri Lanka, historically known as 'Ruhunu' (= South) and 'Uva Welassa' (= Lower Uva). More than two millenniums ago this area became the domain of famous Buddhist kings like the hero king Dutugemunu (2nd century B.C.) and his brother, King Saddhatissa. Around Tree Tops Jungle Lodge there are many indications of the Buddhist civilization existing here 2200 years back in history. The closest town to Tree Tops Jungle Lodge is Buttala, nine km away. According to the 5th century Buddhist chronicle Mahavamsa (Pali: maha: great; vamsa: story), Buttala was the northern border of Dutugemunu's Ruhunu Kingdom and a defense base was placed in the vicinity of Buttala. The Mahavamsa relates that King Dutugemunu - having started his military campaign to unite Sri Lanka under 'one Buddhist umbrella' (ekachatta) - came this way with his war elephants going towards Anuradhapura where he finally won the battle against the Tamil king, Elara. From this time Anuradhapura was the Buddhist capital of Sri Lanka for a thousand years (Burma and Thailand imported their model of Theravada Buddhism from Anuradhapura). About 2-3 km from the lodge a steep chain of rocks and hills rise in the landscape, by locals called Rahat Kandu. In the era of the Ruhunu Kingdom, the top of these hills was the abode of Buddhists monks and the local belief is that several monks reached the state of Nirvana at this place (hence the name Arahat Kanda: Pali/Sinhala, 'Kanda':hill; Arahat: an enlightened person having reached Nirvana). Rahat Kanda would have been a good spot for King Dutugemunu's scouts; as from these hills there is a superb view over the area. Actually there are lots of caves of different kinds and old inscriptions found on rocks. Despite being located in the dry zone, Buttala was in ancient time part of a highly developed art of irrigation systems based on tank building. 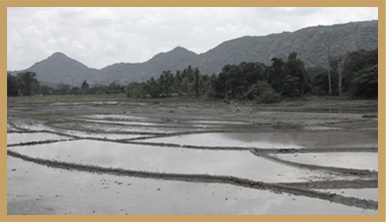 The ancient irrigation system is still used today, especially for the irrigation of paddy fields. As part of Sri Lankas ancient large scale irrigation system, King Saddhatissa - Dutugemunu's brother and successor on the Royal Throne in the 2nd century B.C. - constructed the Weliara Wewa ('tank') which is 3 km from Tree Tops Jungle Lodge. The 40 km Buttala-Kataragama road historically is one of the main pilgrim routes to the important religious shrines of Kataragama. Kataragama is the main place in Sri Lanka where bhakti ('emotional') style religious activity is observed. Tens- or hundreds of thousands of devotees gather here to make vows, walk on fire, pierce themselves with big needles etc. The purpose is to get the god to assist the devotee in 'this life' (Dear God, I do A for you; please do B for me). Peak seasons for the pilgrimage to Kataragama are the days around Full Moon ('Poya'), especially in May and August. On Poya days central elements of the Buddha's life and teachings are celebrated. Most important of the shrines in Kataragama is the Maha Devala housing the six-faced, 12-armed Buddhist God-Kataragama - one of four Lankan guardian Gods in the cosmology of Sinhalese Buddhists. This god is also well known as the god of war, Skanda, in the pantheon of Hinduism. Legends say that the shrine of Kataragama Devio (resident God) was built by King Dutugemunu in the 2nd century B.C. The large white Buddhist Kirivehara Dagoba in Kataragama dates back to the 1st century B.C. While devotees seek favours from God Kataragama to ease 'this life'; they go to the Dagoba to light oil lamps for purposes related to karma and samsara ('other life').